The uncompromising high-resolution AV delivered by an end-to-end digital system isn’t just for luxe AV applications anymore. Demand for the flexibility and scalability of digital has fostered the implementation of more digital in more places. While hybrid solutions will continue to exist near-term, the best investment for a sustainable setup is to go “all in” with a fully digital configuration. Beyond just formats and signal types, going all-digital brings a boost in efficacy that more accurately reflects the unified ways in which people communicate and collaborate today. It’s time to move beyond the connector and get into a platform frame of mind. Here’s how to make the solid choice to go all digital. 1.) UNIFY THE FLOW OF NEW CONTENT FLOODING YOUR ENTERPRISE. Sonic Foundry’s Mediasite video platform It’s important that organizations use one flexible platform for creating, publishing, searching and managing all video. This creates a YouTube-esque environment where employees are enabled and encouraged to share knowledge and personalize communication. You should be able to upload all video, regardless of its source, to your platform and play it on any device. The platform must scale as video use spreads throughout your enterprise. Finding one solution that meets the majority of your needs will ensure a seamless experience from content creation to video management to viewing. Using a single solution like Sonic Foundry’s Mediasite Video Platform means you can flexibly capture, upload and preserve valuable knowledge shared every day; deliver engaging and interactive video live and on-demand to any screen or learning platform; and manage all video assets with a powerful suite of tools to archive, index, customize, secure, search and analyze your content. 2.) THAT SINGLE-PLATFORM BENEFIT APPLIES TO HARDWARE AND SOFTWARE, TOO. QSC’s Q-SYS integrates audio, control, & USB bridging. Digital technology allows users to leverage a platform solution as opposed to a piecemeal solution that requires an AV integrator to link multiple individual products and software together. A platform, like the Q-SYS Platform by QSC, provides a complete, end-to-end solution that integrates audio, control and AV-to-USB Bridging capabilities within a single unified software environment. This approach offers several advantages including design flexibility, cost savings and overall reduction in system complexity. 3.) GET READY FOR THE NEXT WAVE—GO MODULAR. 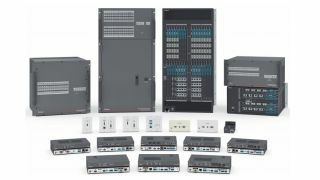 Extron’s XTP II Designers of digital AV systems should always be mindful of the continued advancements and capabilities taking place with related standards. An eye toward the future is key when specifying infrastructure for systems to support ever-climbing video resolutions such as 4K, while also accommodating future growth. Extron’s XTP II provides infrastructure for an 8K future with a modular frame design that offers an easy upgrade path for supporting the newest AV standards by simply changing out input and output boards. XTP Systems is a fully integrated approach that delivers market leading performance with a 50 Gbps backplane plus the versatility to distribute the highest resolution signals locally and over distance with twisted pair and fiber optic cable. 4.) DON’T FORGET TO GET PERMISSION. Digital video signals and sources are smart and need proper feedback from the system on how they are supposed to behave. EDID and HDCP management become much more important in the design and commissioning stages for digital video workflows. 5.) BEWARE OF LATENCY BUILD-UP. Customers that move to an all-digital AV system have the need for HDMI and/or DisplayPort solutions. All-digital solutions include digital routing, switching and extension with signal management and EDID management included. A professional solution will also include zero signal latency, zero signal compression and legacy support for analog in the same system. In line with this, Lightware USA’s MX Series Matrices accommodate HDBaseT, Local HDMI, Fiber Inputs/Outputs, and HDMI Resolutions up to 4K UHD. 6.) MANAGE SIGNAL DIFFERENTLY IN THE POSTHARDWARE ERA. H.264 encoding & streaming by Kramer There is a fundamental shift happening in AV signal management and distribution—moving away from big, bulky hardware based on digital display interfaces to video encoded in the MPEG and JPEG2000 formats, transmitted in packets that travel over IP networks through standard network switches. It’s a practical and scalable approach, and best of all, it’s not proprietary, as AV-over-IP uses standard codecs and Internet transmission protocols. In addition to the holistic Kramer Network (configuration, control, streaming, and monitoring), Kramer offers both video encoders and decoders for MPEG4 H.264 (KDSEN3/DEC3) and JPEG2000 (KDS-EN2T/EN2R) operation to meet bandwidth and bit rate requirements for a variety of applications. 7.) BUILD A WORKFLOW BRIDGE TO VIDEO PRODUCTION OVER IP. NewTek’s NDI solution There is a lot of industry buzz right now about the transition to video production over IP that for many producers sounds both ominous and expensive with uncertain benefits. NDI is a technology developed by NewTek that allows any production or facility to begin reaping the benefits—and there are many—with minimal investment while keeping current production tools in their workflows. It delivers low latency, frame accurate video for live production applications without compromising on visual quality. By taking advantage of existing network infrastructure, NDI delivers a new and enhanced paradigm for storytelling that allows producers to keep up with demand while staying within budget. 8.) START WITH ONE ROOM, AND THEN GO BEYOND THAT ROOM. Crestron’s DigitalMedia DM-DGE-200-C To go “all-in” with digital requires a highly versatile, feature-rich, yet simple all-in-one room solution. That’s the DigitalMedia DM-DGE-200-C. It delivers auto-switching, wireless presentation (with the addition of a Crestron AirMedia), 4K presentation with scaling, auto-display on/off, custom graphics, room calendar display, digital signage capability, control UI, and H.264 video decoding, all together in a low-cost, low-profile surface mountable package. It’s the epitome of a simple all-in digital solution. 9.) MAKE SURE YOUR MEDIA RETAINS ITS INTEGRITY ALL THROUGH THE CHAIN. Preservation and protection of media in digital end-to-end AV systems has quickly emerged as a challenge in this all-digital age. Digital media from source to sink often sees multiple vendor appliances along the way—none of which are particularly concerned with fidelity or security outside their own immediate task. Analog-to-digital and digital-to-digital conversion easily introduce artifacts that reduce the user experience. From a security standpoint, session or security handshakes between different vendor offerings may be disabled or compromised in the interest of just getting equipment to work together. Although analog systems have to be concerned with conversion issues, the level of security concerns are unique to all-digital systems based on their larger distribution footprint. One way HARMAN has addressed this concern is to provide a continuum of product offerings unlike anything on the market including cables, uncompressed digital switching and distribution with the Enova platform, local/LAN/WAN switching and distribution with the SVSI Networked AV platform, wireless media delivery with Enzo, and digital audio transport through BSS and Crown to name just a few offerings. Encryption and fidelity within and between these platforms is all managed to HARMAN standards. 10.) MANAGE RESOURCES ACROSS ALL THOSE ROOMS WITH A PEER-TO-PEER NETWORKING SETUP. RGB Spectrum’s Zio solution Today’s enterprise applications are increasingly bringing together a diverse group of resources spread across a building, a campus or even a city. Advances in AV over IP technology, like RGB Spectrum’s new Zio products, foster greater collaboration through the ability to connect people and resources. Utilizing existing network infrastructure with a peer-to-peer architecture, Zio systems are quick to setup and can scale to any desired size. Zio endpoints also offer a unified management system and configuration tools along with a simple, drag-and-drop user interface.